Hofstra Women’s Ultimate Frisbee traveled to Princeton, New Jersey, on Saturday, November 7th, to participate in the annual Fall Brawl Tournament. The team played 6 games over the course of the weekend, accumulating a superb 5-1 record, with wins over Cornell, Columbia, Temple, Buffalo, and The College of New Jersey. On Saturday, a Callahan point was achieved in each game: one by junior Kelsey Kresge, one by senior Erin Hadden, and one by senior Lauren Curlett. A Callahan point refers to an instance in which the opposing team has the disc intercepted in their own end zone. Senior Madi Scheffer played great defense throughout the weekend, intercepting the opponent's disc on various occasions and leading the defensive effort for the Pride. Sophomore Emily Meredith had a stellar attacking performance, dominating the end zone and scoring multiple goals. Hofstra Men’s Ultimate Frisbee made the voyage to Newton, Pennsylvania for a tournament on Saturday, November 7th. After a somewhat slow start on Saturday - tallying a 2-2 record – the Pride came out strong on Sunday, achieving a huge win against Penn State. Next up was Stevens University, against whom Joseph Murphy cut in the end zone late to catch a perfect scoober pass for a score to secure the win for the Pride. In what turned out to be the match of the day, MIT came out strong and matched Hofstra point for point for much of the game. With time winding down, Spencer Riggins caught a full field deep huck from Gabriel De Oliveira to claim an exhilarating 11-10 win for Hofstra. Heading to the championship bracket, the Pride was pitted against Long Island rivals Stony Brook University. Despite a valiant effort, Hofstra fell to the Seawolves, but still managed an impressive 5-3 record on the weekend. 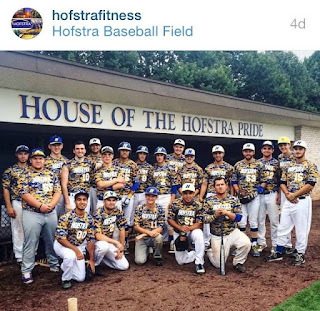 Hofstra Club Baseball traveled to Boston University for a three game series on Saturday, November 7th. The Pride dropped game one 4-2, but managed to take the series by winning game two 9-3, and taking the rubber match 9-6. The team received strong pitching performances over the course of the weekend from PJ Potter, Justin Cusano, and Joe Zapata. The team also benefited from strong hitting performances courtesy of Justin Cusano (5-13 with 3 doubles), Sean Cunningham (4-9 with 2 doubles) and Ben Lawlor (four hits, including a home run). Freshman Tyler Symington also collected four hits over the weekend while being a reliable backstop for the Pride all weekend long. Hofstra Club Ice Hockey matched up against Yale University-the 2nd place team in the Metropolitan College Hockey Conference-on Saturday, November 7th at Ingalls Arena in New Haven, Connecticut. Yale rushed out to a 4-0 lead before Andrew Gagnon finally broke the ice for the Pride 9:26 into the second period after some nifty passing from Guiseppe Chiaravalle and Brandon Fauci. David Craig scored the Pride's second goal, assisted by Darren Schwartz and John Voilkis, before Gagnon added his second goal of the night, but it wasn't enough as Yale prevailed 13-3. Hofstra goalie Tom Calcagno battled hard against a barrage of 71 shots, stopping 58 of the shots he faced.